It's late summer in the Cascades, which means that it's bug season. Sometimes it comes a little before July, sometimes a little after, but this year it came right smack dab in the middle. And it's still here. Racking up at the Blue Lake Trailhead parking lot for a climb in Washington Pass is near suicidal this time of year, as the bugs can seriously ravage you in minutes if you don't start hiking as soon as you step out of the car. You can however, take some preventative measures. Sure you can cover as much skin as possible by wearing pants, long socks and long sleeves, but it sure is hot out and your face, neck, and hands are still exposed. The next thought is, bug spray. There are many repellent options out there, some which are just down right ridiculous (ultrasound based electronics) and others which may spark arguments among friends. Personally, I find it is an argument (or at least a discussion) starter when I whip out the 100% DEET. Personally, I have found nothing that works more effectively and universally than DEET 100%. Some may recommend that you try products such as Deep Woods OFF which is made up of a mixture of 25% DEET and 75% who knows what. What I find people generally do, is use these compressed aerosol can mixtures and spray copious amounts of repellent all over themselves. The result of this is that they get the same, if not more DEET on them than if they used a more concentrated version sparingly, as well as 75% more of whatever else was in the can. 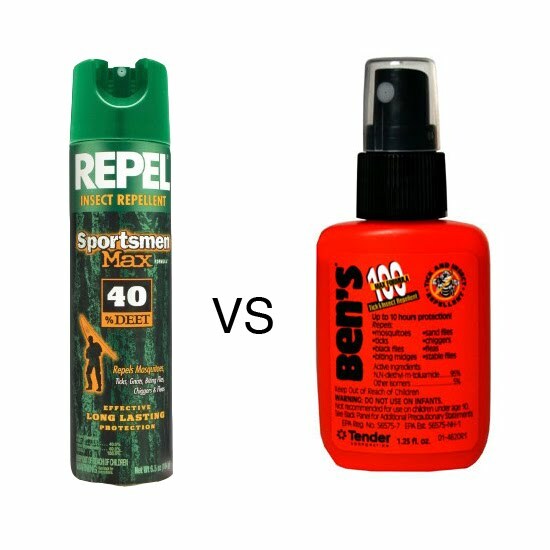 I choose to use the 100% DEET version and place perhaps one spray pumps worth, or a couple of drops, on my hands and rub the chemical on my exposed skin. 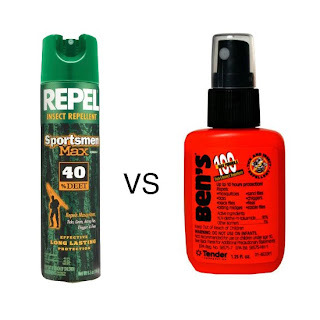 Most companies say 100% DEET will last around 10 hours, and I think that's about right, but it doesn't matter because you will know when its effectiveness stops (it's rather dramatic). There are arguments against DEET, such as it discolors skin, decomposes synthetic fabrics and can cause seizures. There have even been four deaths which the EPA says DEET may have played a part in. However the number of reported cases lead the EPA to say that the likely seizure rate is only one in one million users, and I feel like my chance of contracting West Nile Virus, Malaria, Lyme disease, or the bubonic plague is much greater than one in one million. Not to mention the complications of those diseases are generally much worse than seizures. There are other options besides DEET however, and I suppose I should mention those at least briefly. Avon Products produces a "Skin So Soft" line that contains the chemical IR3535 and some tests have shown that it is just as effective as DEET (if not better), at least when it comes to repelling mosquitoes. I think that this is probably the next best option and what I would try if I took the time to shop around for this product. "Avon Skin So Soft Bug Gaurd Plus IR3535 Gentle Breeze SPF 30 Sunscreen with Aloe and Vitaman E." Man, I just want to keep the bugs away... not moisturize. And then there are natural options, which honestly I'm not going to bother discussing. I have never used a single natural product that did anything more than make me smell delicious to koalas. You are more than welcome to experiment with these options, however I encourage you to have some anti-itch cream on hand as well. DEET effectiveness plateaus at 50%, so no reason to go anywhere near 100%. And interestingly, Canada does not permit anything over 30%. Studies are showing that there may actually be some long term effects of constant DEET use, including that it increases the toxicity of other nearby chemicals. Ruth posted an interesting topic. DEET may be harmful and everyone must know the precautions when using it. Sandfly Repellent is definitely out of the many repellent options available in the commercial marketplace.